Home » Can Solar Panels be Recycled? What Materials Can Be Obtained from Solar Panels? What Happens in the Recycling Process? 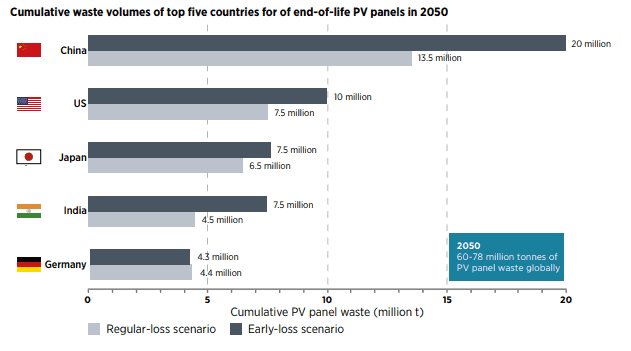 Large-Scale Solar Panel Recycling – Can It Be Done? What Can Be Done to Promote Solar Panel Recycling? The solar industry growth rates keep increasing every year across the world almost exponentially. However, an industry that is proud to promote clean energy consumption and that is proud to be a sector concerned about climate change, cannot forget to dispose properly of the electronic products that exceed their lifespan. Countries like the US, Japan, and Germany have reached almost 50 GW of solar PV capacity to the end of 2017, which as we can imagine, represents millions of solar panels that will become waste between 2040 and 2050. Solar panels do in fact last between 25 and 30 years. That being said, the day will eventually come where those solar panels will stop working or degrade to a level of inefficacy. At that moment, the lifespan will have ended and they will have to be recycled into raw materials for further manufacturing of new solar products. As you can imagine, the short answer to the question above is yes, solar panels can be recycled. But what can be obtained from this recycling process? Solar panels have to be classified according to the technology in order to be recycled. Conventional silicon-based technologies like monocrystalline or polycrystalline modules can be treated similarly, but thin-film solar panels based on components like Cadmium Telluride (CdTe) or Copper Indium Gallium Selenide (CIGS) must be treated separately, as their composition is much more complex and can even be toxic. 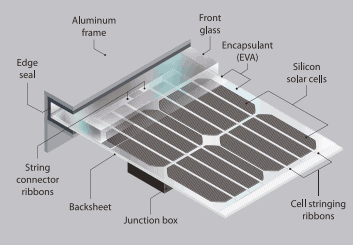 Conventional silicon modules are composed of materials such as copper (1% -interconnections), silicon (5% – solar cells), aluminium (8% – frames), polymers or plastic (10% – encapsulant l) and glass (76% – surface of module). On the other hand, thin-film technology contains several thin layers of semiconducting materials that are deposited onto glass, polymers, or metal. CIGS solar panels can be adjusted to achieve high light absorption, thanks to the adjustment of the light spectrum that varies according to the composition of the semiconducting materials (indium, gallium, and selenium). From CIGS modules we can recycle 89% of glass, 7% aluminum, and 4% of polymers. The extraction from other materials such as copper, indium, gallium, selenium, zinc, and other metals is almost negligible (0.2%). CdTe solar panels use cadmium sulfide and other materials such as cadmium, tellurium, and copper to develop the layers of solar cells. The proportion of glass in CdTe modules is higher than in other modules reaching 97%, and leaving nearly 3% for polymers. Other materials such as nickel, zinc, and other metals represent less than 0.5% of the total volume of the module. Here we can see a proportion of each technology and its materials in a percentage of the total volume of the module. The first step is disassembly and dismantling of the PV array, including cables, steel, aluminum, racking and other electronics (inverters, batteries, etc.). Then, solar panels are packed and transported to recyclers or landfill sites depending on local regulations. Since most PV systems were installed from 2010 onwards, PV waste quantities are still not as large as to create massive market incentives for investors to install specialized PV recycling plants. Thus, solar panels are typically processed in general recycling plants. Major components such as glass, aluminum, wiring, and polymers can be easily recycled by merely mechanical separation. 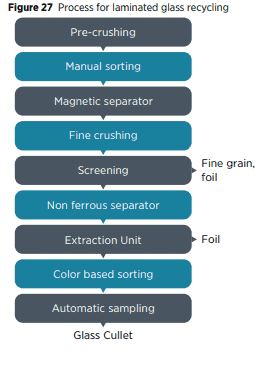 Then, to ensure that these materials do not contain high impurity levels that could reduce the resale prices of these materials when getting back to the market, it is necessary to conduct a combination of thermal, chemical, and metallurgical processes. 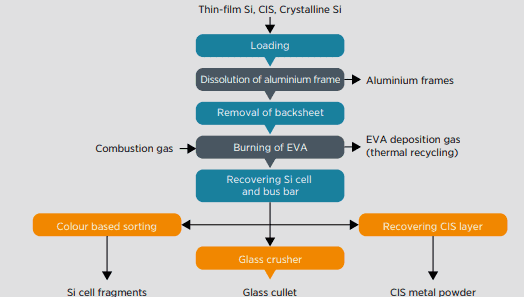 Regarding the process for the laminated glass component of silicon modules, we can see the steps in the figure below. Does the solar industry have the resources, tools, recycling plants, and market to recycle large quantities of solar panels? The short answer for that is no. The market for this sector is not yet clear nor is its policy framework, regulations, economics or methodologies in many parts of the world. This presents a new environmental challenge for the PV industry that needs to be addressed in the US, Japan, Germany, India, and especially in China as the country with the highest accumulated PV capacity in the world (130GW in 2017). Actually, based in IRENA’s estimations on a report from 2016, global panel waste projections will be as high as 78 million tonnes, equivalent to almost 4,500 GW in capacity by 2050. The greatest contributors to this waste will be China, the US, Japan, India, and Germany as you can see below. The first step is developing a policy framework just as it exists in Europe with the Waste Electrical and Electronic Equipment (WEEE) regulation that requires all producers supplying solar panels to the EU market to finance the costs associated with dismantling, transport, and recycling of end-of-life modules. Companies like PV Cycle in the EU have also intervened in this aspect as a non-profit organization that focuses on the recycling of solar panels inside the EU. 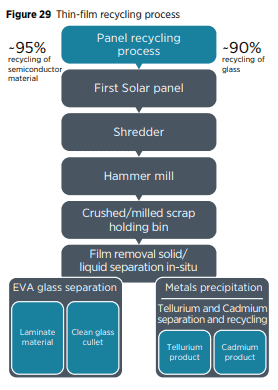 PV Cycle leads the way in the definition of methodologies and costs to effectively recycle the solar panels. Other companies like Veolia and Recycle PV also do their part in the US to start the development of the recycling market. As more companies join to this market, it is also necessary that more government initiatives take place, such as the stewardship of Washington, which requires manufacturers who sell solar units in the state of Washington to be responsible for financing and providing a recycling program for their modules. The European continent has led the way on this sector, but it is a matter of time until other regions like China, Japan, US, India, and Australia follow the path to ensure the conservation and reuse of the PV market.